OLD PARKED CARS. 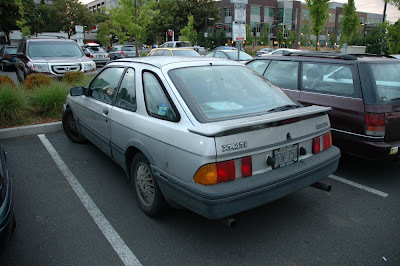 : 1987 Merkur XR4Ti. The child in me loves big factory wings and dual exhausts on anything/everything, even if it is a 4cyl and hurting performance. I'd love to have one of these, and imagine I was driving a Sierra Cosworth. 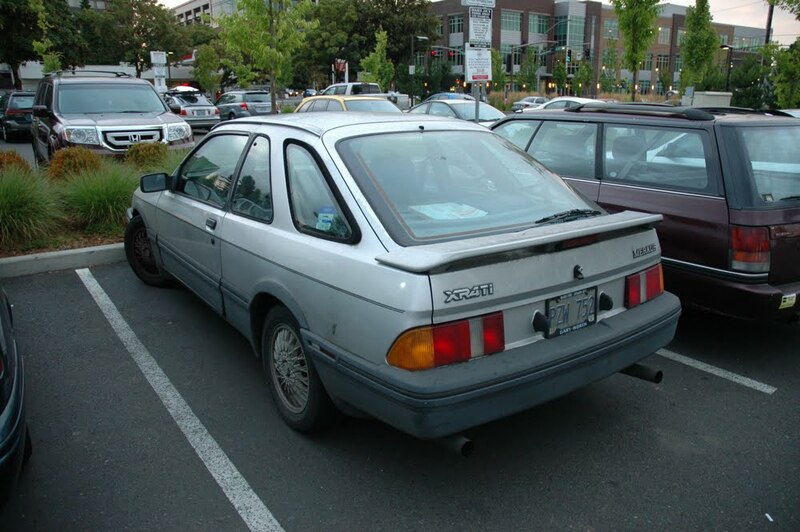 This car is very similar to Ford Sierra. Why couldn't they just sell it as a Ford Sierra? What's with that strange name? I think the Sierra XR4 was only sold with 4 WD in Europe (named XR4x4), not too sure about that though. "Why couldn't they just sell it as a Ford Sierra? What's with that strange name?" Oldsmobile was already selling the Cutlass Ciera at that time. I don't think Ford could have brought in the name Sierra without a battle with GM. also has anyone heard of the GMC Sierra? yeah that wouldnt go over well with GM. Love this old beauty i wish i had one. Anyone else think this body could have pulled off pop up headlights with ease? Also, click those links I posted above. i actually have no love for pop-up headlights. "non-flush" headlights have become an obsession, though, and this grill-less face takes them to the next level. 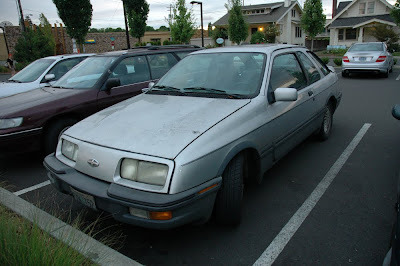 I owned a 1985 XR4Ti.....the car was incredibly radical in appearance at the time. Mine was jet black with a light gray leather interior and 5-speed stick. The car was an absolute BLAST to drive.....when it wasn't in the shop. I'm surprised this car is still running. Hard to say from here, European side of the pond. Thank God, it didn't have those AWFUL "double biplane" rear spoilers. Who was the GEEK who designed that crap? Those double wings, were also on the SVO Mustang. Talk 80's goofiness. These cars would make a nice drift project... too bad their reliability is pathetic. I saw a red one, in a driveway and asked if he wanted to sell it, he said he was shipping it to California. 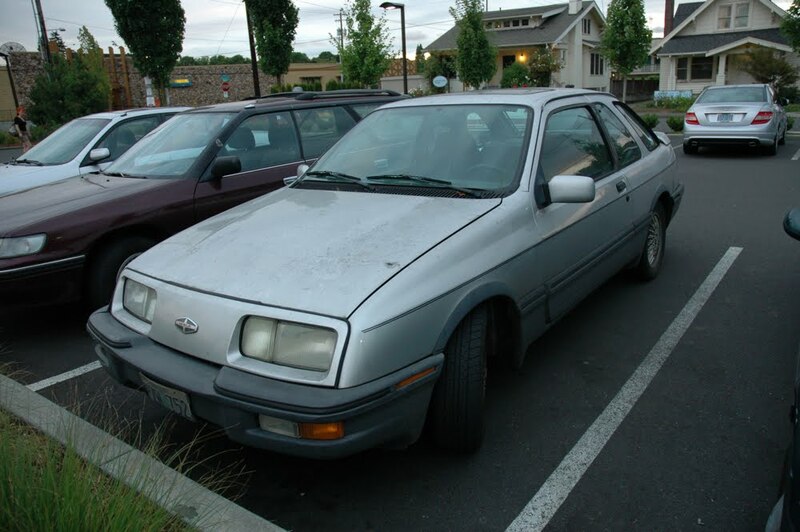 It was an 89, the last year of production for the XR4Ti.